On Saturday, November 16, four paddlers and I launched our kayaks from Oak Beach at 10:30 AM and headed out on the bay for five hours. The day started out being a bit overcast, but the skies gradually gave way to a fair amount of sun with puffs of clouds scattered around here and there. We started by paddling west a short distance, crossed over to Fire Island and then headed east toward Robert Moses Causeway. I was lagging a short way behind, because you know me–I am out there taking pictures! Within the first hour and to my total disbelief, I came across my first harbor seal of the season about 60 feet off the bow of my boat and all alone! 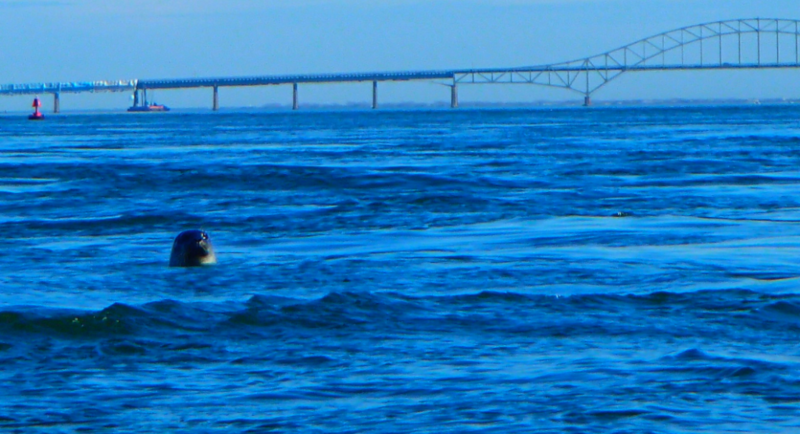 Actually, this was the first time I have ever seen a harbor seal around Long Island. It was truly an exciting moment. The seal seemed to be as curious about me as I was of it. We stared at each other for several seconds as it stretched its neck high above the waterline and then down under it went, only to pop up over on my right. We went through the same ritual several more times until it finally completed a full 360 around my kayak. Not wanting to scare away the seal I remained frozen in my seat, but during one of its vanishing acts under the water, I quickly grabbed my camera and was able to snap a picture as it resurfaced. Lucky that I snapped the picture when I did, as it went below the surface once more and disappeared into the chop, not to be seen again. Thoughts of seeing the harbor seal remained with me throughout the rest of my day on the water! It didn’t get any better than that! Your friend will be in the NACK Winter Newsletter & Journal. I have gone on seal watching kayak trips before and they only come up behind the kayak. You must have seen a photogenic one.